Hi Everyone! Wishing all of you the best weekend. Stay warm. Love the holiday tags. Just everything right, size, image, painting! What a lovely surprise to see my snowmen here - thank you! Preps for Christmas, oh my, I've not started thinking yet. Happy PPF everyone. Very fun.... Can't believe the holidays are right around the corner. Congratulations. Congrats to Carola. They are so cute I'm just starting to get into the festive mood. What adorable artwork and to think I have been throwing my odd off cuts from joinery work into my wood burner as kindling! Beautiful little snowmen! I love all things snow since I've been living in Miami for over 25 years now. I miss NY and these little guys remind me of "home." Happy FAF! darling ornaments by Carola! We got our first taste of snow last night! Just a dusting thank goodness. Happy PPF ! So beautiful and charming..wonderful art!! I love Carola's artwork! So cheerful and fun. Wow Carola's ornaments are beautiful! 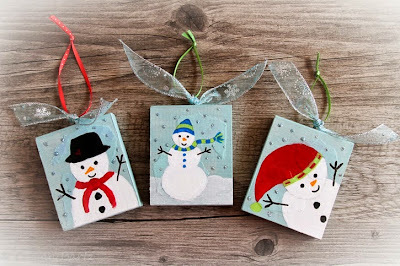 I only decorate with snowmen in the winter and these are perfect (I can't see to get decorations down by Feb 1st and it's still snowing then so the snowmen are appropriate for awhile after the holidays!) - visiting from PPF! Oh, those ornaments are divine! Really gets me in the mood for Christmas projects. Happy PPF everybody! I love Carola's ornaments!!! How cute. Happy PPF everyone! What darling ornaments! So sweet! Your ornaments are super cute. Happy PPF! The Snowman ornaments are charming. Congratulations Carola. Congratulations being feature Carola!! So glad to see your beautiful ornaments here! First comment I spelled your name wrong...so sorry!! What a wonderful feature! I love this meme--having just lost my Husband, it is really good to be in contact with the lovely folks associated with Paint Party Friday. They have been a great comfort to me. Blessings to you for PPF. Have a lovely weekend.